Fletcher was the result of a repeat mating of Scott to Ella and was given to Emma & Daren as a companion for the boys, Nathan & Owen. He developed well and Emma decided to show him occasionally. He first qualified for Crufts 2014 with a 3rd in Junior Dog at Three Counties Ch Show in June 2013 and was 2nd in Junior Dog at Windsor Ch Show. He was 1st in Debutant Dog at Bournemouth Ch Show, 1st in Yearling Dog at SKC Ch Show & ECSSC Ch Show, 2nd in Yearling Dog at WKC Ch Show in August 2013 & at the ESSC Ch Show in October 2013. He was 3rd in Yearling Dog at City of B'ham in August 2013 & at Richmond Ch Show in September 2013. He first qualified for Crufts 2015 with a 2nd in Post Graduate Dog at YSSC Ch Show in May 2014 and was 1st in Graduate Dog at NWPBA Ch Show in July 2014 and at WKC Ch Show in August 2014. Fletcher was 2nd in Post Graduate Dog at SKC Ch Show in August 2014, 1st in Graduate Dog at the ESSC Ch Show in October 2014 & 1st in Post Graduate Dog at Manchester Ch in January 2015. He first qualified for Crufts 2016 at WPBAW Ch Show in April 2015. Fletcher then won Limit Dog at Three Counties Ch Show in June 2015, winning his KC Stud Book Number and then went one better to be awarded the Reserve Challenge Certificate. 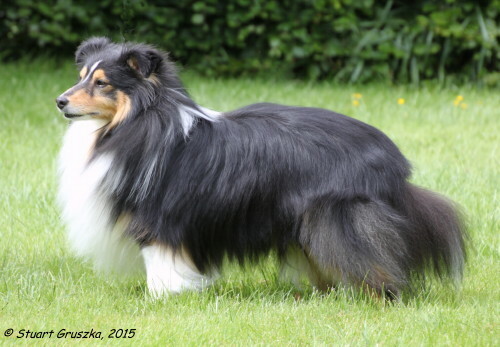 Fletcher was 1st in Mid Limit Dog at ESSC Ch in October 2015.